Beholders are one of the most recognisable monsters created for the Dungeons & Dragons tabletop role-playing games. They first appeared in print in 1975, because none of us ain’t getting any younger. Thus, that somebody would wonder what sort of DC Heroes RPG stats they’d have seems inevitable. Beholders are a mystical (or alien) race. They would most commonly be found during a “demon invasion” style scenario, or in the depths of space. It would not be uncommon to find them as bodyguards to demon lords. They are slave holders and will almost always have several “monster” bodyguards of their own. Beholders are solitary creatures. Being hermaphroditic they don’t even have to associate with other Beholders to reproduce – and most don’t. (Though rare ones will mate with a fellow beholder). Only a variant beholder called a “hive mother” can force beholders to tolerate each other. Hive Mothers often create variants on standard beholders. These beholder abominations are generally only found in the vicinity of a Beholder hive. Beholders are large (6-8 ft diameter) floating orbs. They have one large central eye, and 10 smaller eyes on eye stalks on the top of their bodies. Their skin is warty and knobbed. They have a huge fanged mouth, and the larger ones are capable of swallowing a human. 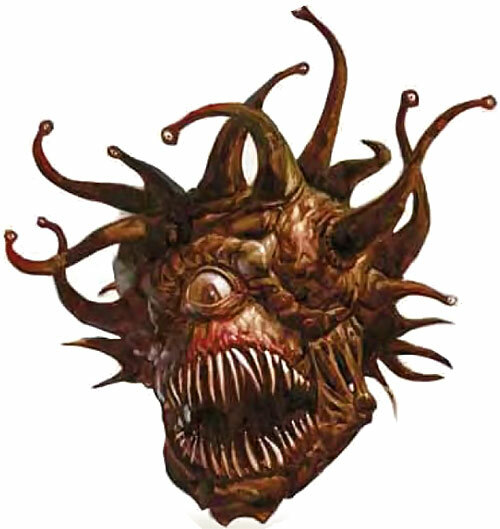 Beholders are nasty, vile, and hate other species with a passion. Only beholders are due any consideration in life, and only beholders that look like the beholder in question. All other life forms are fit only for food or slaves. Variant Beholder types are to be destroyed. However, Beholders love knowledge, and will often master several academic fields. They can be quite persuasive, if needed – unlike most warmongers, they do have a keen knowledge of how others think and feel. In the standard DC universe, Beholders would almost certainly be a race of demons, and only encountered when summoned by sorcerers. It is possible that one might attempt to take over a group by using its powers of control/hypnotism. They could also be yet another of the myriad number of alien races already present in the DC universe. How does the idea of a Beholder Green Lantern strike anyone ? Iron Will: 04, Full Vision: 08, Skin Armor: 02, Claws (Bite): 04,Flight: 05 (Move is 3, Flight can be subbed as OV without costing a dice action – Beholders are quite maneuverable within a small range. Flight is Form Function, being achieved through manipulation of naturally occurring gas produced within the beholder’s body. Disintegration (ML): 14, Range: 3 APs. Hypnotism (ML): 10, Control: 8m Range: 5 APs Limited to humans and near human humanoids. 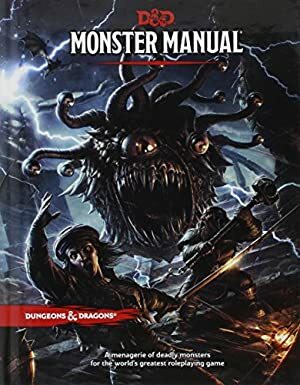 Pure AD&D note: For a greater “AD&D” flavor limit this to convincing the person that the beholder is their best friend, most trusted confidant etc, and then the beholder has to persuade the person to do whatever the beholder wants them to do. Hypnotism (ML): 14, Control: 12m Range: 5 APs Limited to “monsters”. Also, see limit above for number 3. Paralysis (ML): 12 Range: 3 APs. Bonus: Turns person to Stone, and has a permanent duration. The Beholder can turn a person back to flesh at will. Many sorcerers will be able to undo the effects as well. The Sidekick supplement has the Petrification power, which can also be used here. Phobia (ML): 10 Range: 4 APs. Cell Rot (ML): 06 Range: Normal. Only affects living creatures. Mental Freeze (ML): 10 Range: 4 APs. Produces Sleep if successful. Glue (ML): 10 Range: 5 APs (Note: Is actually a “slow” beam, which slows the person in relation to the time stream. It does NOT produce any glue-like substance at all, and doesn’t even possess any physical substance.) Bonus: Successful Raps affect the AV of all powers as well, and subtract from the APs of movement powers ; Bonus: Cannot be broken free from, but must be endured until it expires (after a number of phases = to successful RAPs). (Central Eye) Neutralize: 25 Range: Partially variable. When eye is fully open range is 5 AP length, 3 APs high, 4 APs width. When squinting can be narrowed to 0 AP width, 5 APs long, 2 APs high. These ranges are at 5 APs Beam narrows down the closer you get to the beholder (like a flashlight beam widens from its source). Affects everyone within the stated range. Foe and friend(?) alike. Also affects power manifestations which enter the area. This includes the Beholders own eye beams (they don’t function in the area of effect of its central eye). Attacks all powers of each person within its area of effect. All powers immediately return to full level when eye beam ceases. Beam is turned on and off at will. Limitation: Does not affect gadgets, and the beam is clearly visible. Note: To be truer to the AD&D version, you might want to limit this beam to affecting mystical powers only. Charisma: 08. Possibly other skills, depending upon the individual. May make multiple dice actions in one round. May use 1-4 of the smaller eyes on attackers in 90 degree front angle, 1-6 within a 180 degree front angle, 1-8 with a 270 front angle, and all 10 if attacked from all sides. May use all 10 small eyes if attacked from above. Central eye only effects front area (Note: eye placement varies from individual to individual). Example: If three people attack a beholder from the front, it could conceivably disintegrate one, turn another to stone, and put the third to sleep – all in the same combat phase. If the smaller eyes are individually targeted, they can be destroyed (for one week) if 1 or more RAPs is gained. Treat as a trick shot. However, this does not hurt the beholder. The Central eye must take 3 RAPs or more to cease functioning. Beholders have their RV increased by 4 when defending against the eye beams of another beholder. For a more “pure” AD&D flavor, you can drop the above and note that Beholders are immune to the following Beholder eye beams – the Control/Hypnotism beams, Paralysis (Flesh to Stone) and Death Ray. They are subject to the effects of the following eye beams ONLY if the beholder using them is an ancestor of the beholder on which they are being used. Phobia (Fear), Paralysis (Sleep) and Slow. (This says a lot about Beholders as parents, doesn’t it?) All other eye beams – cell rot and disintegrate, affect them normally. Strange Appearance, Catastrophic Physical Restriction: No arms or major manipulative appendages, Misc restriction: Cannot learn Occultism skill while they possess their central eye. If their central eye is blinded (and killing damage of 3 APs or more directed specifically against the central eye will permanently blind the eye) then the Beholder could learn Occultism. Helper(s): Sean MacDonald, JKCarrier, Joshua Marquart, and several people on claws for the bite. Source of Character: AD&D game, second edition.